Just in time for October, we have the first in my favorite category of Nancy Drew mysteries — hauntings! Though I wouldn’t call the Nancy Drew series scary as a whole, Her Interactive knows how to set up a creepy mystery. Rose Green, a friend of a friend of Nancy’s is turning a Victorian mansion into a bed and breakfast in San Francisco. Renovations have been moving much more slowly than anticipated due to a large number of accidents occurring in the house. It’s up to Nancy to discover if the problems are being caused by someone within the house or the ghostly spirits rumored to walk the halls. Rose Green is the main character of this game, as she owns the house and will run the B&B once it opens. She doesn’t believe the stories being thrown around about ghosts and spirits, and suspects that choosing an inexperienced handyman is the root of her troubles. Rose is a very practical person, and I found myself drawn to her for her down-to-earth approach to all the problems she encounters. It’s also worth noting that Rose is a woman of color, and a woman of color in charge of the whole operation. Good on you, Her Interactive, for starting to introduce some diversity! The aforementioned handyman is a college student named Charlie Murphy. He cam to Rose looking for work: Work Rose couldn’t refuse at his low prices. He claims to know nothing about the accidents and insists that his work is top-notch, despite his relatively short time in the carpentry business. Though he is the most likely suspect for all the things that have gone wrong around the house, it’s hard to argue with his baby-face and friendly nature. 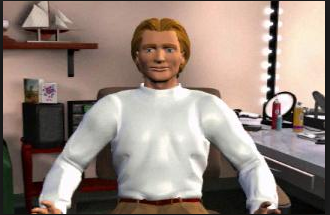 Plus I’m pretty sure his voice actor is the same one who voices Nancy’s boyfriend, Ned, in later games, so it was difficult to think of him as anything other than a source of good information and support. But that’s player knowledge, and player knowledge must be resisted! Louis Chandler is the resident expert on all things Victorian and has been helping Charlie and Rose ensure that all the renovations are as accurate as possible. He came to Rose as an adviser and has offered her a break in his consulting fees in exchange for unfettered use of the house’s original library. He seems unconcerned with the recent plague of accidents and doesn’t think Abby’s stories of unsettled spirits hold any water. Though he doesn’t appear to have a motive for causing the accidents, he is guiding Charlie’s inexperienced hand and often dodges Nancy’s questions. The only one who truly seems to believe the talk of spirits is Abby Sideris, Rose’s friend and co-owner of the mansion. All Abby ever wants to talk about are the spirits haunting the house, and she barely acknowledges the upcoming opening of the B&B. She doesn’t concern herself with renovations or the business side of things like Rose does, but instead focuses her time and energy in getting in touch with the ghosts of the mansion. But does she really believe in the ghosts, or is she trying to divert suspicion from herself? The entirety of MiaHM takes place within the mansion, which works both for an against the game as a whole. The lack of travel shortens the game considerably, but in a way that subtracts little and adds a great deal of convenience for the player. My least favorite part of Nancy Drew games is always the travel between locations. However, having only one location does make the game feel a bit claustrophobic. Granted, this helps enhance the feeling of creepiness and danger that comes from playing around in a potentially haunted old mansion. 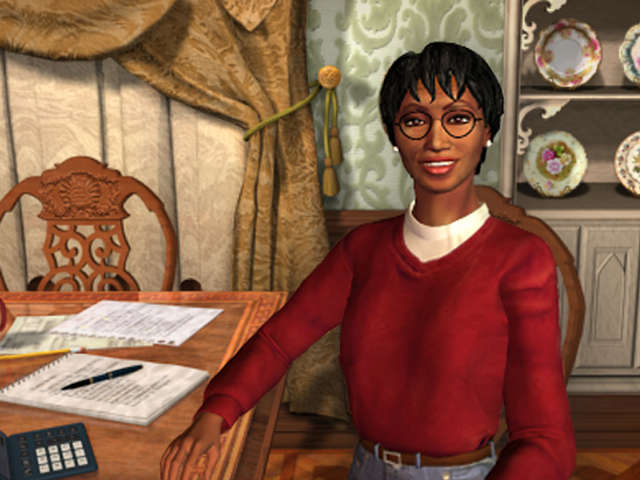 Haunting games are my favorite category of Nancy Drew games, and replaying the first of this type was great fun. There were a couple of genuinely creepy moments, but it’s obvious that Her Interactive is just getting started with the scary games. There’s so much going on that suggests a haunting that I became numb to the stimulus. Every time I crossed a certain hallway, I saw a ghost out of the corner of my eye, and there were often spirits visible within the mirrors of the mansion. But, because the game takes place entirely in the mansion and the player runs around the area a lot, these events are triggered a great number of times, and seeing the exact same thing so many times takes the creepiness factor way down. If you’re looking to try out a Nancy Drew game, go ahead and give MiaHM a shot. It’s super short and a great way to get your feet wet. It has held up decently well over the years and provides a good number of puzzles with just the right amount of challenge for players unfamiliar with the genre. If you’re familiar with the series, you might want to skip this one. It’s good, but experienced sleuths will blast though it extremely quickly. Sink your teeth into one of the more difficult and longer later games. Mattie Jensen, a star on the popular soap opera Light of Our Love, invites Nancy to stay with her in New York in order to investigate a series of death threats aimed at her co-star. The victim, Rick Arlen, seems unconcerned about the threats and refuses to go to the police, despite the increasing severity of his stalker’s actions. Stay Tuned for Danger is quite old for a computer game. 18 years old, in fact. My computer is not old. It is very new. The two didn’t play well together. I played off my hard-copy disk and my computer refused to support the game’s sound, even while running in compatibility mode. Even my partner – magical computer genie that he is – couldn’t finagle it into working. But I’m stubborn, and knew that I wanted to play every single game, so I decided to play it without sound. Turns out, sound is a big part of what makes the Nancy Drew games fun for me. It just wasn’t the same without the background music, character voices, and sound effects. 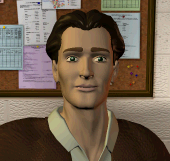 It was so much less fun that I ended up starting my Senior Detective game over with the difficulty at Junior Detective, just so things would go by a little faster. And I used the forums way more than I should have for the same reason. I just wanted to move on to the next one. But, I do want to give credit to Her Interactive for their work on subtitling the game. STfD’s closed captioning is truly exceptional, and allowed me to enjoy the dialog even without the sound. Thank goodness, because a great deal of the game is spent in conversations. Also, the game is now available in a remastered edition from HerInteractive.com, so you don’t have to worry about any of that! The first person Nancy meets is Mattie Jensen, her hostess and the reason Nancy even has her second case. Mattie is a successful actress and it was nice to have a successful young woman in a place of prominence in the roster. She cares for others and is into traditionally “girly” things, but never comes across as a caricature of young women in general. I remember liking Mattie a lot as a kid, and that hasn’t changed. Rick Arlen is Mattie’s co-star and the center of the case. Because he stars as the romantic lead of the show, he has a large base of adoring female fans, but if they ever interacted with him, they would maybe be singing a different tune. Rick is skeevy and always seems to be trying to get some from every woman he meets. Including Nancy. When I was younger, I thought it was kind of funny, but now that I’ve met people like this in my own life, I just kind of hated the guy. Besides co-staring on Light of Our Love, Rick and Mattie share an agent. Dwayne Powers met Rick and Mattie during the early days of their careers, when they played small theater shows together. Dwayne doesn’t stick out as a character, since Nancy doesn’t interact with him nearly as much as the Rick or Mattie. He’s just kind of there, you know? Dwayne Powers in his sad office. Lillian Weiss is the director of Light of Our Love and lets you know it. From square one she makes it known that she doesn’t like you, or anyone really. She’s the stereotypical cold woman of business who will do whatever it takes to get things done. She serves as a barrier for much of the investigation, which stacks the deck against her as a character. Lillian and her permanent scowl. Above even Lillian on the food chain is Millie Strathorn, the owner of World Wide Broadcasting. Though you’d never know it from the way she keeps herself sequestered away in the prop room. Sometimes it’s hard to know if she even knows she owns the studio. Her sense of reality has become skewed. Millie is by far the most memorable character of STfD. Even outside of her dottiness, she’s funny, with a genuine sense of humor about everything. 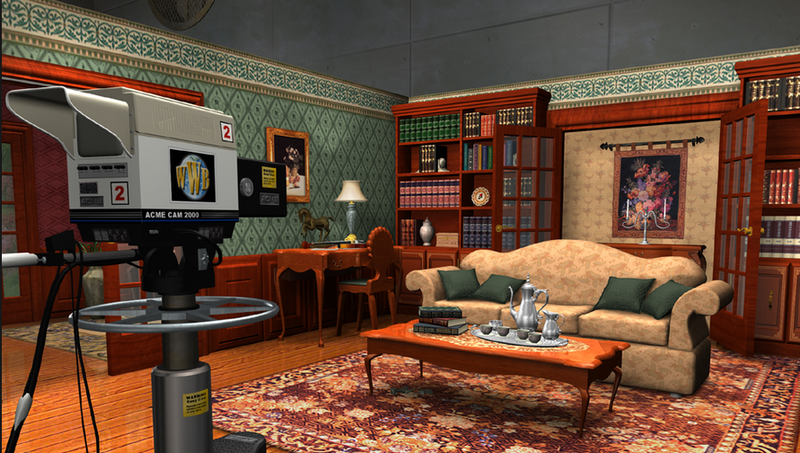 The prop room was my favorite area in the game, and a good deal of that was because of Millie. Mad Millie, owner of WWB and fearless guardian of the prop room. Getting past the lack of sound took some time and the bug certainly lessened my enjoyment of the game, but it wasn’t the only problem. Her Interactive was still getting into the swing of things with STfD, so the gameplay is rough. It’s hard to move around in STfD: A big problem when Nancy is constantly moving from one place to another. A lot of times I would click somewhere, thinking that I was going to move in that direction, only to zoom in on something I didn’t care about. And vice-versa. This may be fixed in the new remastered version, but it was certainly a bear to deal with using the original game. There’s also a lack of puzzles in this game when compared to others in the series. Rather than having Nancy solve something in order to move on, the game was more concerned with having Nancy talk to people and see clues in the correct order. At one point, tired of running around trying to figure out how to activate the next segment of the game, I looked at the forums – only to find that I had done everything, I just hadn’t zoomed in far enough on one item for it to count. I’d read the information on the thing without actually having Nancy read it. Ugh. While I’m glad I played STfD in order to return to the Nancy Drew series’ roots, I’m happy to move on. I don’t recommend it to anyone new to the franchise, as there are so many other games that are much more polished and enjoyable. Does this post look familiar? It was originally published on my old blog back in October 2015 and has been transplanted here with some light editing.